Based on BC-06 this product is a highly concentrated Per-Hydro-Polysilazane (PHPS) coating especially designed to allow application by conventional wipe on. BC-09 creates a highly durable hydrophilic layer of special polysilazane molecules that can protect the paint from contamination and dirt and deliver a improved scratch resistance. This coating will keep your car clean for a long time and will prevent impurities from sticking to it’s surface. BC-09 creates a special type of lustre and reflection on the surface of your clearcoat. Modesta BC-04 is capable to withstand temperatures of up to 1300 °C. 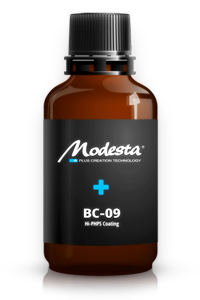 BC-09 may not be used in combination with the Modesta P-01A Primer. However BC-09 might be used as a foundation layer for other coatings of our range, especially BC-03 Pure Glass Coating, BC-04 Nano-Titanium Glass Coating or BC-05 Advanced Water-repellent Glass Coating.